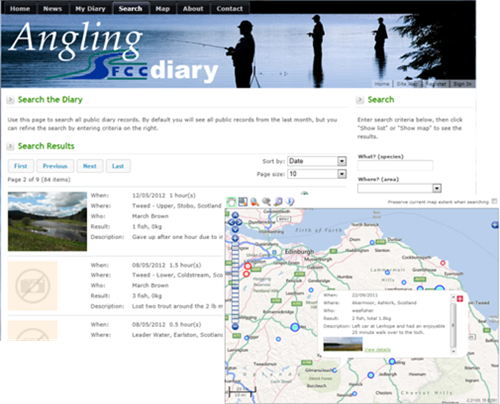 We developed the Angling Diary, an innovative online diary for Anglers in Scotland. This application helps keen anglers keep track of their season, while also providing analysis and high quality data to the biologists at the Scottish Fisheries Co-ordination Centre and Rivers Trusts, to help manage the waters sustainably. The collection of diary and catch data can be searched and analysed in various ways, with fully interactive mapping. The site was built within a Content Management System to allow the project partners to update the content.